How a mid-level, associate professor of communications at a college ranking 57th in Regional Universities North by US News trusted collegiate evaluation system appointed herself Queen Gatekeeper of Media Outlets remains a curious open question. However, Melissa Zimdars of Merrimack College nevertheless attempted to do exactly that this week — much to the delight of Hillary Clinton-loyalist corporate media presstitutes around the nation. Zimdars’ vapid list of, in essence, media outlets to avoid because she said so lacked explanation, justification, reasoning, research, ratiocination, rationale, rectitude, and generally proved she has an agenda that involves insulting the public while pushing an establishment agenda. In short, a self-appointed false vanguard of journalistic integrity utterly failed a simple task in her class lesson on journalistic integrity — Zimdars let journalistic integrity be damned. Awkwardly titled “False, Misleading, Clickbait-y, and/or Satirical ‘News’ Sources,” this previously-unknown associate professor’s list only slightly differentiated between an infinitely intricate web of news outlets to teach her “Introduction to Mass Communications” students a lesson about sources. Naturally, tasked with a Herculean research endeavor to present a credible, trustworthy list, Zimdars did what any esteemed educator attempting due diligence would in such a situation — she asked Facebook. Duh. Amassing said list apparently didn’t take long, and the young, unapologetically neoliberal associate prof then spent months carefully delving into the bowels of each website to parse out precisely the level of integrity each deserved in order to provide her students and friends in the establishment communications realm with a tool worthy of publication. Just kidding — she did none of that. Zimdars instead proceeded to list the outlets she and her friends feel should be degrees of verboten because they said so and stuck this non-information in a public Google doc. 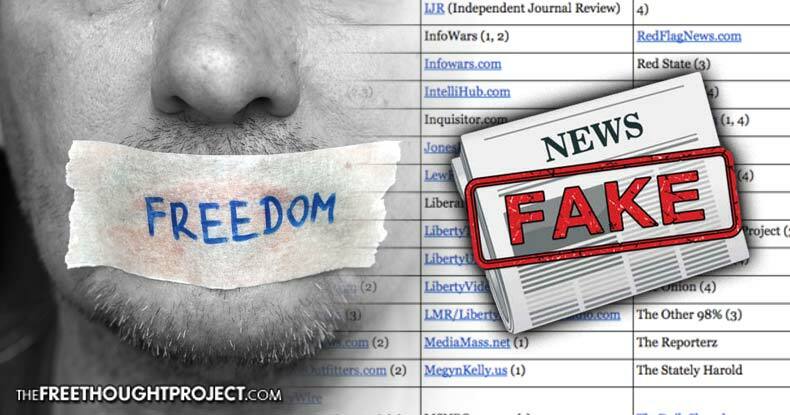 Unsurprisingly, given the call for unreliable sources bounced around Zimdars’ echo chamber, the feckless list — although it indeed includes a few notorious false information generators — serves as an appalling condemnation of reputable alternative media sites, admittedly-biased right-leaning organizations, and Bernie Sanders-supporting left-leaning outlets. In a tragic turn of events, however, corporate media outlets (somehow not deemed Scarlet Letter-worthy by this establishment liberal echo chamber) not only gleefully re-published the Zimdars list, but also failed — yet again — to perform due diligence in assessing its veracity. Even worse, corporate media amplified this buffoonery by zeroing solely on the word “False” from the title, employing the exact “Clickbait-y” tactic Zimdars ostensibly takes issue with. “Fed up with fake news, Facebook users are solving the problem with a simple list,” Business Insider proudly and erroneously declared, for example. That sloppily cobbled together statement, alone, should redden the cheeks of the major corporate media so-called news outlets who re-published Zimdars’ list, if not alert her employer to the need for a grammar refresher course. But enough of soft-target practice, because the entire mess allegedly spawning the need for such a list in the first place — whether it would have come from an obscure associate professor, a corporate media presstitute, or a well-intentioned alternative media journalist — boils down to one truth. And that truth presents a commentary on all of us, the societal Western whole, at least as embarrassing as The List, itself. In fact, Zimdars could only have failed categorizing news sources — no matter how cursory or exhaustive the effort — because very few people read the articles anymore. All of us are guilty of headline-sharing. Some are guilty of skimming or perusing only the first paragraph or two. And the vast majority of people not in the journalism and media industry — actually, many of them, as well — don’t follow links to peruse original sources and fail to search for multiple reports on the same topic. And rarely call into question vague, anonymous sources cited by previous scions of journalism, like the New York Times. “Clickbait-y” headlines — of both the unintentionally misleading and intentionally deceptive varieties — are a result of this. A plethora of literal, actual fake news sites are a result of this. Satirical commentary re-reported as cement truth are a result of this. Government propaganda cited as expertise is a result of this. And this embarrassing bankruptcy of intellect amounts to a criminal obscenity, and the backlash — against reputable alternative media organizations, admitted partisan outlets, and, generally, dissenting opinion — imperils us all to fascistic gatekeeping of information. Because, in case you haven’t yet heard, President Obama declared “fake news” — the problem that never was — a grave threat to democracy. Now we have a war on dissenting opinion with censorship and suppression hot on its heels, and an elected leader of the so-called free world touting the most undemocratic tactic in existence, censorship of the press — by essentially saying a free press threatens democracy. Don’t be fooled by such totalitarian rhetoric — the only threat to democracy, to the leftover remnants of liberty we can still clutch, is a government attempting to control the boundaries of allowable thought. Consider these points next time you jump to share anything without reading the information within — such an act, now, is a potential nail in the coffin of a free press.